Whirling Hygrometer (also known as Sling Psychrometer) - wet and dry bulb. The whirling hygrometer also known as a sling psychrometer is made out of two thermometers mounted on a frame which rotates around a handle, so it can be whirled in the air by hand. One thermometer is covered with a tight-fitting muslin sock which is kept wet by preferably with distilled water. This type of thermometer is known as the wet-bulb thermometer. The other is the dry-bulb thermometer and exposed to the atmosphere directly. Made in accordance with BS2842. Housed in a yellow plastic case with folding Handle. No electronics and therefor great for us in mines. How does a Whirling Hygrometer work? The psychrometer is whirled to let air past the bulbs which in turn makes water evaporate from the muslin cloth, This in turn cools down the wet bulb temperature. The amount of cooling that occurs dependant on the amount of relative humidity. With high relative humidity the wet bulb will cool less than in dryer air where the water in the muslin will evaporate faster. The dry bulb indicates the temperature of the air. The wet bulb helps determine the relative humidity. With air less than 100 per cent relative humidity, the wet bulb will display a lower temperature than the dry bulb and is known as wet-bulb depression. A special chart is used to convert the wet-bulb depression to relative humidity or the relative humidity can be determined by correlating the readings with those on a simple slide rule, which is supplied with each instrument. HygroPalm HP32 is a versatile handheld instruments compatible with all HC2A and HC2 Rotronic probes, it is able to perform spot measurements and logging of relative humidity, temperature and other psychrometric parameters. This Product is now obsolete please click on link for the new replacement!!! 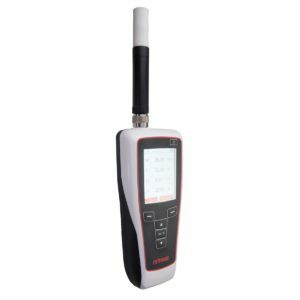 The HP22 is a versatile hand-held indicator that displays relative humidity, temperature and a variety of calculated parameters such as dew or frost point based on the measurements of a HygroClip2 plug-in probe. Probe selection is based on the application. Depending on the HygroClip2 probe model, the measuring range is within 0 to 100 %RH and -100 to 200°C (-148 to 392°F). The HygroClip2 probes feature durable sensors and consistent performance. All HygroClip2 probes can be hot-swapped to facilitate routine calibrations. The HP22 indicator offers extensive settings and functions that can be enabled and configured by the user either directly from the keypad or with the ROTRONIC HW4 software. 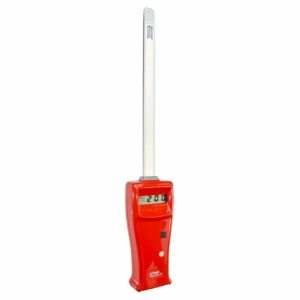 The HP21 is a highly accurate handheld indicator that displays relative humidity, temperature and dew or frost point temperature. The HP21 is perfect for spot checking HVAC installations, manufacturing or storage areas and any ambient air measurement within the temperature range of -10 to 60°C (14 to 140 °F). The HP21 is designed to meet a wide range of user requirements from the most basic applications to the most demanding applications. The HP21 indicator offers an extensive set of settings and functions that can be configured and enabled by the user with the ROTRONIC HW4 software. 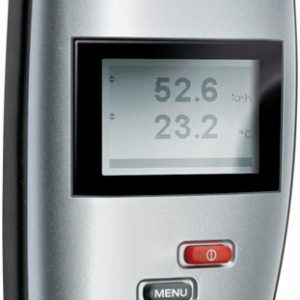 In spite of its high end design, the HP21 is ideal even as a simple humidity and temperature indicator.